Chris Moller is a camping enthusiast born in Switzerland and the founder of Campanda, a web-based company that matches unused RVs with RV renters worldwide. Anyone, from an RV dealer to an RV owner, can apply to list their RV for rent on the Campanda website. Owners that use their RV only part of the year can list it with Campanda, set their own terms and prices, and make money with the RV instead of just parking it. Learn more here. If renting out your RV is not for you, you may still enjoy Campanda Magazine. The magazine is how we found out about Campanda’s RV rentals in the first place! One particular Campanda Magazine article is entitled, “The sofa made me do it.” Who could resist reading more? The author, Camille Attell, writes with candor and humor about, after 20 years in the corporate world, leaving everything behind to live, work, and travel in an RV. Enjoy Camille’s article here. If you liked Camille’s writing style, you’re in luck. Camille has a master’s degree in counseling psychology and change management, so knows something about transformation in life. According to Camille, if you’re anxious, you’re normal. 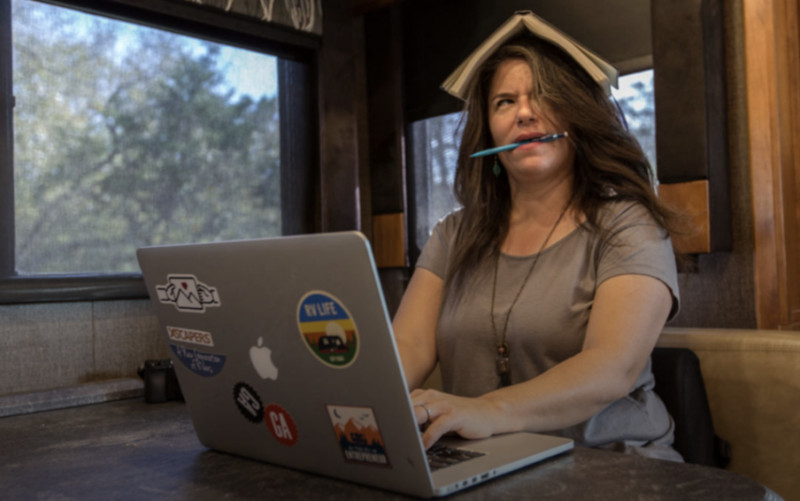 She write to help prepare RVers for the emotional challenges of full-time RV living at More Than A Wheelin’. The choices to keep the comforts of a brick-and-mortar home and add an RV for long road trips, or to sell your home and go full-time with the RV lifestyle can be daunting. For some, it comes down to cost. For many, it comes down to the thrill of adventure. For both, there’s the aspect of simply choosing freedom. Here are some thoughts on going full-time. Whether you are looking for adventure on the road, or parking seasonally in climates that suit your style, you want to choose the right RV at the beginning. There’s money to be saved with a used RV, but if you choose a preowned RV be sure you have inspected by an independent RV inspector. Weight the cost of a new more efficient RV with lower operating costs vs. a pre-owned RV that’s less efficient and likely to need ongoing repairs. Boondocking in public spaces like Walmart parking lots or public lands will save money when you are on the road, but when choosing to put down roots in a RV Park, look for one with one-site management, great laundry facilities, convenience to shopping and medical care, and appropriate lots with space for patios and slides. There are many choices, more than we can mention here. But isn’t that what the lifestyle is about anyway? The choice to keep life simple, affordable, and flexible. 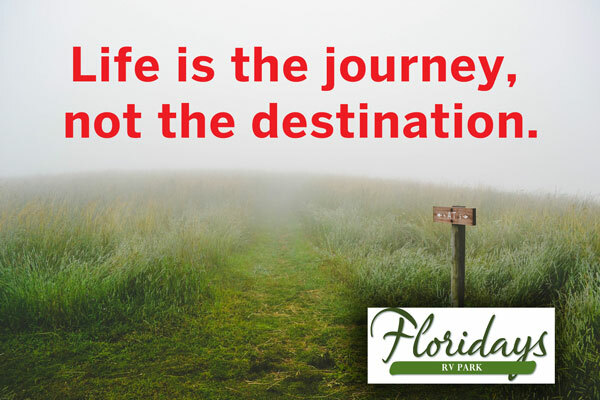 We’ve often heard that RVers believe that life is the journey, not the destination. We’d love to hear about the choices you think are important and why. Visit our Facebook page. The Martin County Fair is the single largest event, drawing upwards of 70,000 people of all ages who come to be delighted with the food, entertainment, music, livestock, and history of this annual event. This year, the Fair celebrates it’s 60th year, so plan to be there! Tuesday: $.25 Admission Day. Beef & Dairy Show, Music Concert, and 60th Anniversary Party. Wednesday: 2 Music venues and Swine Showmanship. Friday: 3 Music venues and Beef Showmanship. Saturday: 3 Music venues and Steer & Swine Auction. Everyday, there are carnival rides galore, from bumper cars to a looping roller coaster. Complete Fair Calendar. 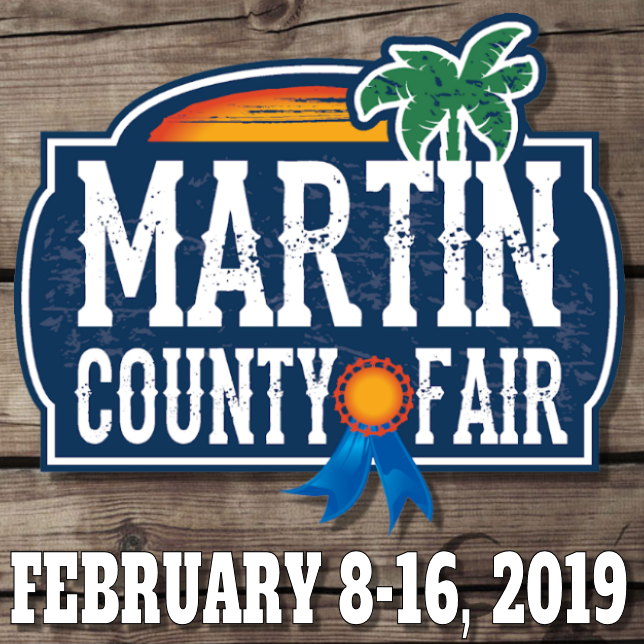 The 60th Martin County Fair is all about good, wholesome family fun, great entertainment, friendly competitions, community pride, and educational experiences for the whole family! Take photos and post them on Floridays’ Facebook page! Have a great time at the Fair. Floridays RV Park wasn’t always the safe, friendly community it is today. 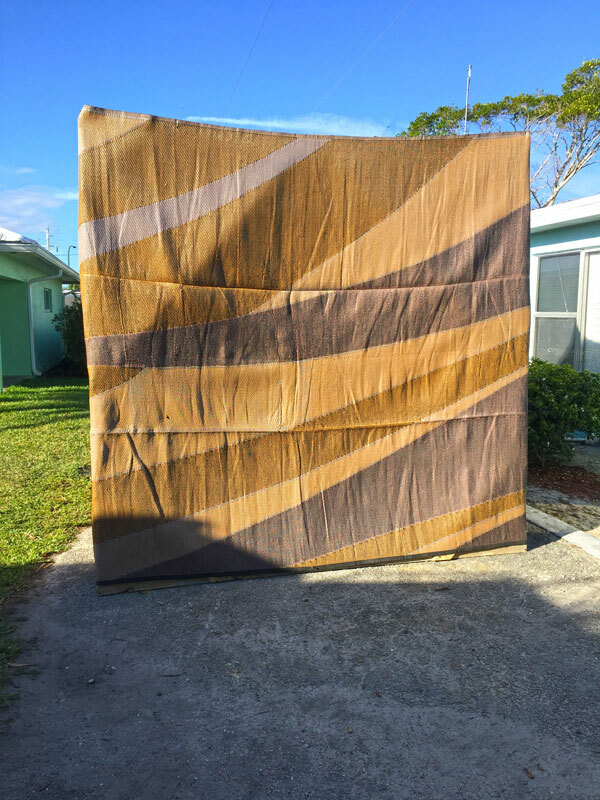 Nine years ago, Mike and Susan Graham purchased the “Angle Inn Mobile Court” in Hobe Sound, a run-down eyesore with only one outstanding feature…the welcoming, industrious mobile park Manager, George Vryhof and his wife Sandi. Managing Angle Inn had been a nightmare—no budget and an uncaring owner unwilling to make improvements. But things changed under the Grahams’ ownership. Today the park thrives with a new brand, large spacious pads, new bathhouse, new laundry facilities, secure mailroom, and an active social scene during the winter season. For all these reasons, the Vryhofs wanted to show their appreciation to the Grahams. 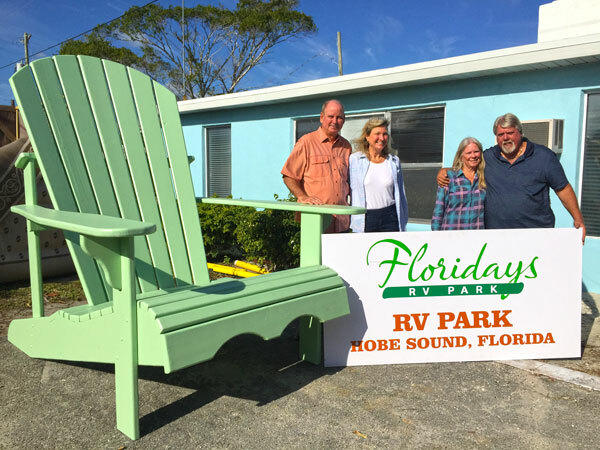 While boondocking in the Florida Keys, George and Sandi discovered the colorful wooden Adirondack chairs by the Key Largo Adirondack Company and the idea was born to build the world’s largest Adirondack chair as a gift to park owners Mike and Susan. Harold and Julia Post, Gervais and Suzanne Roy, and Bruno and Claudette Arseneau are friends and neighbors from the small village of Beresford, New Brunswick, Canada. Beresford is a seaside community on Chaleur Bay, one of the most beautiful bays in the world. They winter in Hobe Sound at Floridays RV Park and are often seen rushing over to help George with this or that task, whether it be shoveling dirt or any of the daily tasks needed to maintain the park grounds. 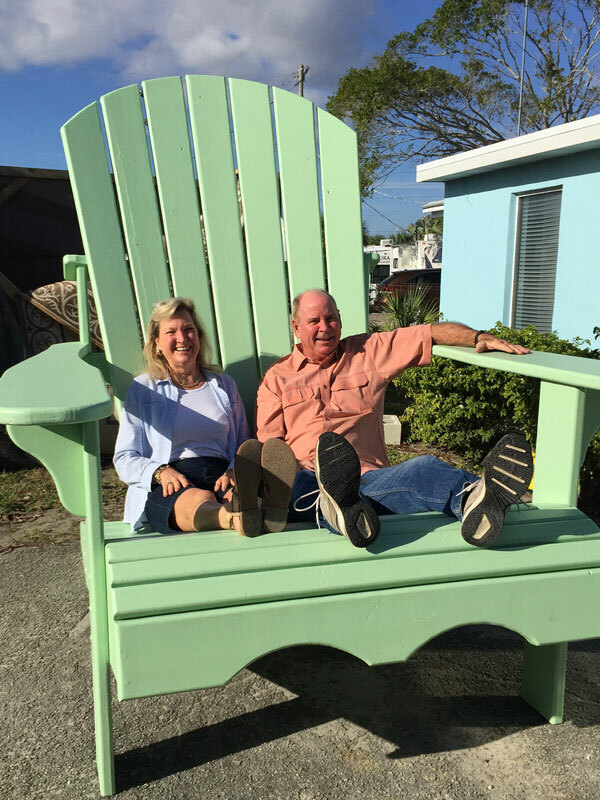 Their plan to build “the largest adirondack chair in the world” was downsized after discovering that honor goes to a 26 foot chair! 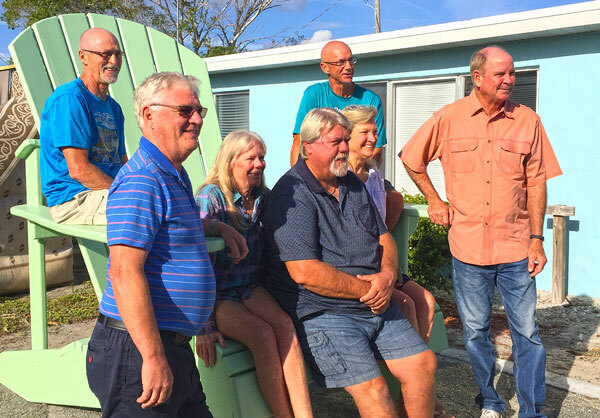 But the 8-foot-tall chair they did build took only three days to cut, form, prime and paint thanks to other Floridays residents such as Larry Bourgaize from Canada and Greg Lutzen from Connecticut who also pitched in to help. When the chair was ready, except for the Floridays logo that will added later, residents gathered next to the park office to await the arrival of Mike and Susan who had been surreptitiously called to the park on a sunny Saturday morning on January 12, 2019, to receive “a gift” from George and Sandi in appreciation for their commitment to Floridays. The following photos commemorate the unveiling of The Big Chair. Video of the unveiling, and Mike and Susan joyfully sliding onto the chair, are on our Facebook page. To reserve a stay at Floridays, register well in advance on our website or call George at (772) 546-5060. A recent article on TripSavvy about the five best RV blogs to follow caught our attention. So we dived right in to discover which blogs we thought our fans would enjoy. Hours and many pages later, we found ourselves still on the first listing: Love Your RV hosted by a Canadian named Ray. Ray and his wife Anne have been a full-timers for seven years and have logged over 60,000 miles from their home base in Nanaimo, BC, Canada. His monthly blog has 6 sections: Tips & Tricks, Mods & Upgrades, Product Reviews, RV Travel, Boondocking, and of course, About Us. Ray offers a free eBook, Tips to the RV Life, as a gift when you sign up. We did! The eBook is beautifully done, well written, and packed with great photos and super useful articles, tips, and suggestions. Fifth Wheel owners will want to read the eBook article on 5th wheel maintenance. Every article was well organized, full of great stuff, and worth reading. The home page has a link to an Amazon shopping page that could save time if you’re looking to buy outdoor furniture, sanitation supplies, lighting, and a host of RV wants and needs. The blog has over 400 posts, so you’ll want to bookmark their site for hours and hours of good reading. 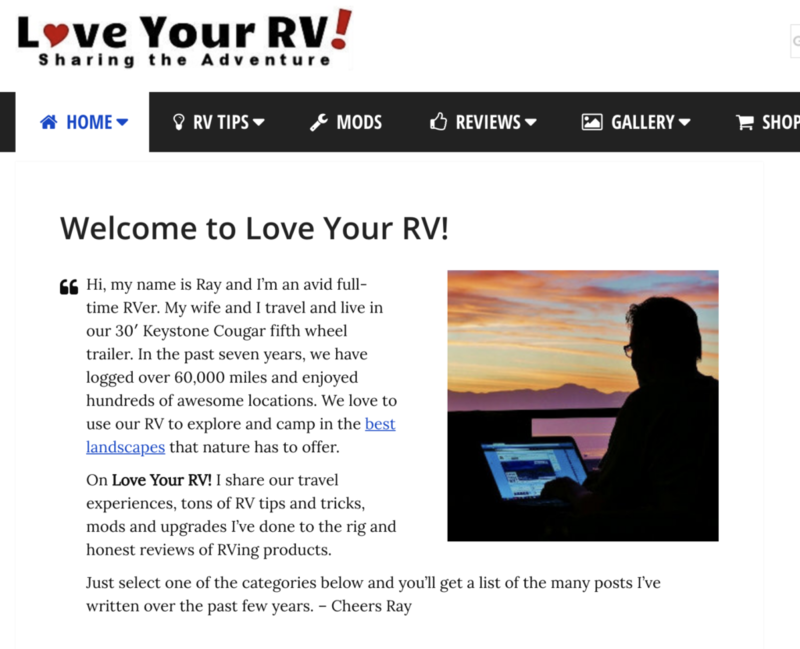 In fact, they’ve recently launched a sister site to LoveYourRV.com called RVHappyHour.com, a social community where RVers can meet and mingle online. He calls it a “virtual happy hour”—sort of a sit-around-the-campfire-with-new-friends-and-share -experiences-to-help-each-other-out kind of blog. Ray comments how social the RV lifestyle is and says that he’s made more friends and connections since they began their RV lives than he made in the previous 20 years. He sounds like a great guy. We checked his travelogue at travellerspoint.com and discovered he’s never stayed at Floridays RV Park. Hopefully, the next time they come through Florida they’ll look us up. Events and happenings at Floridays and elsewhere along the Treasure Coast, plus occasional news and updates from us. We don’t share your email address, and opt-outs are in real time.